Stratigraphy can be a fickle beast. In a previous post, I explained at length how it can become a nightmare. I’m sure I’ve alluded to the stratigraphic terrors that I’ve been unveiling here at Sainte-Candie. Nevertheless, here’s a quick refresher for the newbies or the ones who were sleeping in the back of class: Stratigraphy is the recording of past events, both anthropogenic (influenced by human behavior and activity) and natural (e.g. erosion, flooding, and volcanic eruption), in the archaeological or geological record (read: in the dirt). Each event creates a stratigraphic unit, in the form of a layer, feature, negative feature, or lens. The passage of time allows each unit to be deposited one on top of the other, the most recent events being closest to the surface and moving further back in time the deeper one goes. This is called the law of superimposition. If Ferdinando is reading this, then he is orobably cringing while looking at this picture. 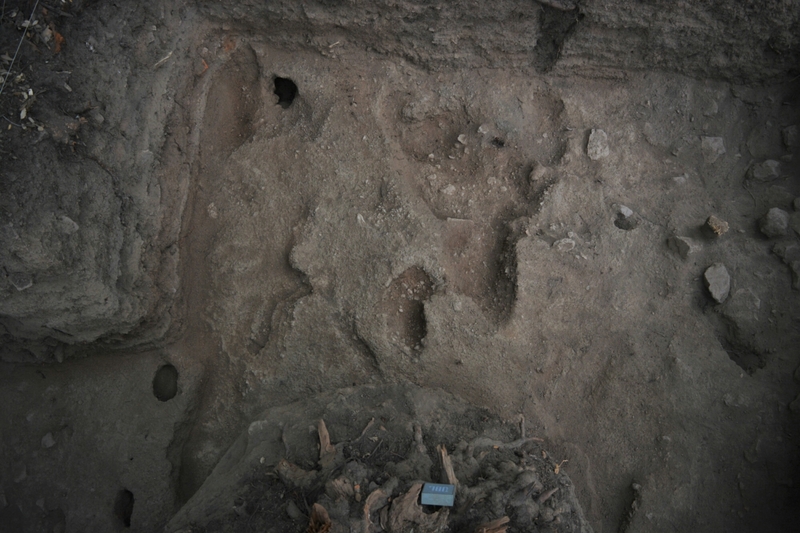 Note that us excavating these pockets here and there don’t necessarily resolve our issues. Often, the have only revealed the same uneven distribution of the layer-after-next’s surface. To put the conundrum in terms of the above explanation of stratigraphy, we were clearly looking at two separate stratigraphic units, but their apparent relationship defied the law of superimposition, as the layers wrapped around one another in a way that didn’t allow for them to have been deposited in separate events chronologically. Thus, I made a call. We had to remove both soils together, as by all indication, they were deposited at the same time. I did have the foresight to make a note in our registries of the complex relationship present, and designated both soils as their own unit (16026, 16026A, and 16026B to be exact). The battle really lay with explaining all of this to Jean-Antoine. He’s been very busy managing the excavation of the trenches further up on the summit, especially given the presence of some special archaeological features (rhymes with rave, just add a G). He’s been down intermittently as our stratigraphic quandry unfolded but he’s only been able to give a cursory assessment of the situation and give minimal advice to that end. Thus, imagine his surprise when I told him yesterday and it really sunk in that we had excavated roughly 50 centimeters worth of soil in only two units, despite the profile in the bulk displaying 8! After some back and forth, he had reassured me I’d made the right decision given the circumstances, and some thorough adjustment of our records would account for the situation. Yeah. Tough couple of weeks. 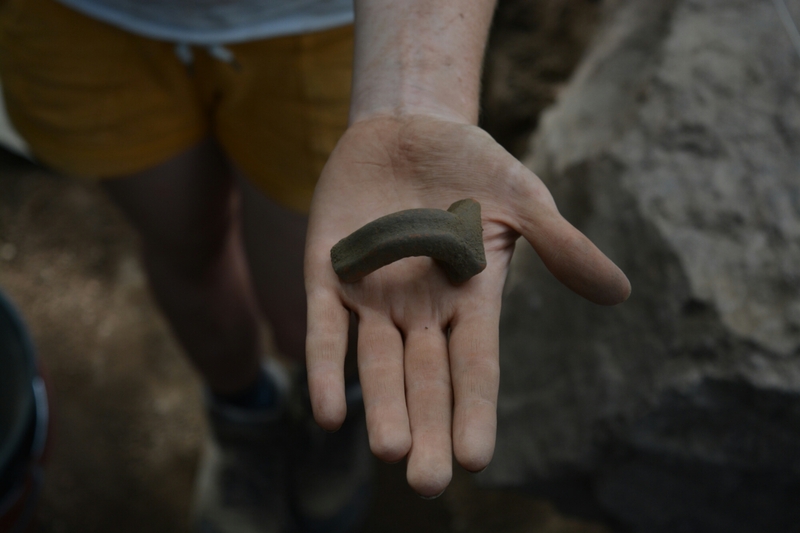 I was recounting my stratigraphic nightmare along with my other field season woes to Caity, a digmate from this season in Italy, and she reminded me of the value of artifacts. She was telling me all about the great things she was finding at her project in Bulgaria; she was finding things like red-figure pottery and jewelry from the Ancient Greeks and their neighbors on the Balkan Peninsula. 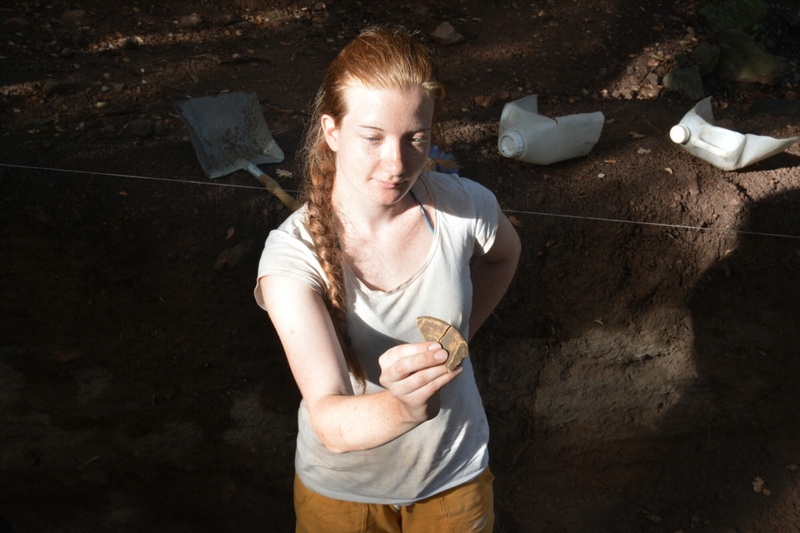 Normally, I dismiss the glamour of finding “special” finds like coins and jewelry so that I don’t lose focus on the bigger picture, which is proper excavation and the consideration of a body of artifacts from a context together in order to create a more comprehensive interpretation. Only then can we begin to answer the research questions behind a field project. Nevertheless, I had to admit, I was a little jealous of the stuff she found; I was slogging through stratigraphy laid by Hades himself and barely had any nice artifacts or structural remains to show for it. I thought about that and realized that perhaps I needed to reconsider what I was finding. 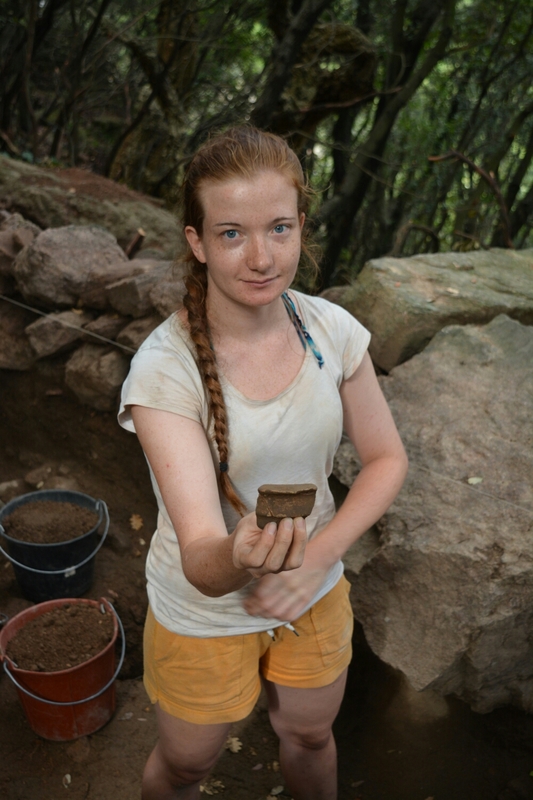 The degraded bits of pottery and tile have significance too, and I can’t get too caught up in the stratigraphic sequence, lest I totally discount the value of the “little finds” towards understanding the people and past we’re studying. 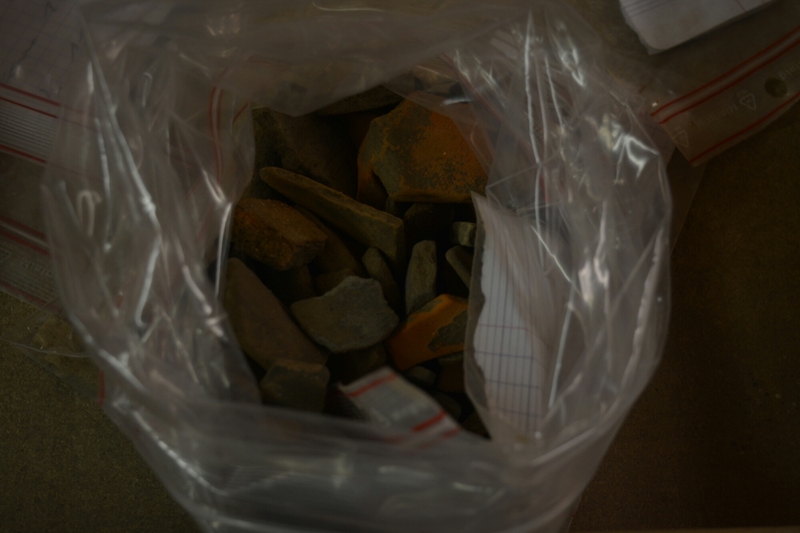 By the tine we close a context, we usually have a bag full of sherds of pottery. While they come out of the ground dirty and worn, when theyre cleaned up, they serve as a reminder of domestoc activity, regional and international trade, as well as local industry. Iza is holding the mouth of an amphora here. When cleaned up, one can see the white slip with the pink fabric, indicating its North African origin. An amphora handle from no earlier than the beginning of the 8th century imported from Africa. These pieces are parts of vessels used to transport important commodities like wine and oil. We know from the composition of the ceramic they came from North Africa between Late Antiquity and the early middle ages. Thus, we can gather that our site had trans-Mediterranean economic connections well after the collapse of the Western Roman Empire and in spite of the sociopolitical turmoil of the period. Another common, and often under regarded artifact are fragments of tegulae, or ceramic tiles used to cover roofs in antiquity. 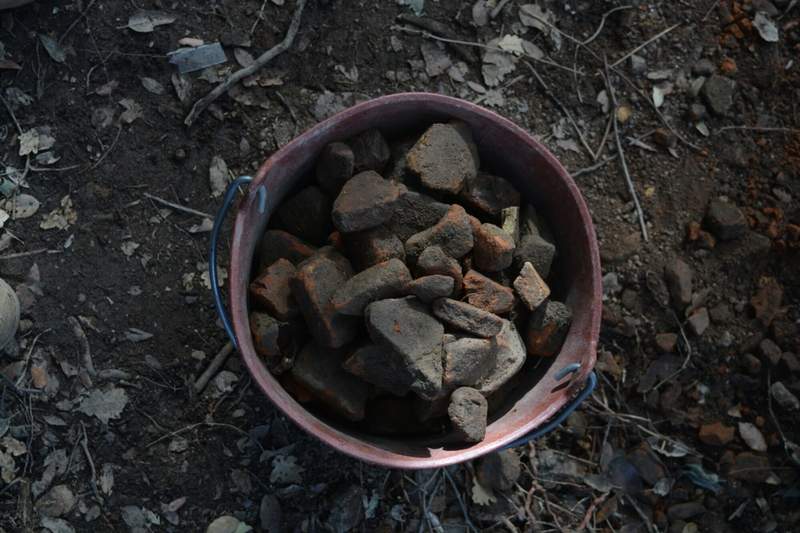 We've found several buckets worth of them as we have excavated downward. Sometimes, these fragments are the only artifacts we find in a context. Ugly and beaten, they once were manufactured in the millions to cover the roofs of houses into the early middle ages. We’ve been finding them even in our later period contexts, when their manufacture ceased. What do they tell us? Well, often these tiles were broken up and reused as components in walls and floors in later periods. Their presence let’s us know that we are either excavating a context contemporary with this recycling-architecture, or one immediately after it, when these secondary constructions fell into disuse and ruin. They’re like a little marker letting us know our soil isn’t completely barren. It is always important to find value in the little things.